With a focus on enhancing brand, revenue, and media opportunities, Michael LaPlaca has presided over one of the University of Dayton Flyers’ most successful eras. With UD since 2006, he currently serves as an assistant athletic director, managing all digital and television platforms. During the 2015-16 season, Dayton became the first NCAA Division I program to broadcast men’s-basketball games in Mandarin Chinese. LaPlaca worked with six students from China to air all 18 home contests via Stretch Internet. Now in its second season, the program has been featured on CBS This Morning, CBS Sports, The New York Times, and Pear Video. LaPlaca implemented an enhanced television partnership with Time Warner Cable/Spectrum. During the 2015-16 season, for the first time in school history, every men’s-basketball regular-season game was televised. The television package included a mix of national and regional television partners. The half-hour Dayton Flyers Insider show offered a behind-the-scenes look at the men’s basketball team and other programs. LaPlaca also coordinates live-streaming broadcasts and shoots and creates features. He directed a team that won the 2010 College Sports Media Award for Outstanding Promotional Video or Campaign. The video helped the men’s basketball team start the 2009-10 season nationally ranked for the first time in its 104-year history. In 2007, LaPlaca developed a partnership with the Communication Department to merge live broadcasts with coursework, a program that has helped UD students secure jobs at CNN, ESPN, the Big Ten Network, and Fox Sports Ohio. He helped develop the DaytonFlyers.com website and a social-media platform into a highly regarded online community. More than 3 million unique visitors visit Dayton’s online outlets per year. Designing materials and plans for promoting Dayton Flyers athletics, LaPlaca crafted a digital-marketing strategy focused on ticket sales and merchandise. Season-ticket holders for men’s basketball have reached an all-time high, averaging more than 10,000 the past six seasons. 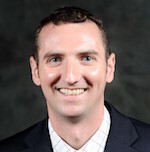 He has been a member of the College Sports Information Directors of America (CoSIDA) since 2003, Sports Video Group since 2008, and NACMA since 2011. Previously, LaPlaca was sports information director at Manhattanville College and director of media relations for the El Paso Buzzards, a minor-league hockey team.